It’s autumn, the clocks went back an hour last weekend and today is the last day October, so you could definitely say that we’re slowly getting towards the end of the year. With the season changing, I noticed a massive difference in my skin. My skin started feeling a lot tighter in the beginning of September and I started breaking out again due to uni stress. So in September I started to change up my skincare routine a little bit until I found a routine that would work for my skin, which I think I may have found now. 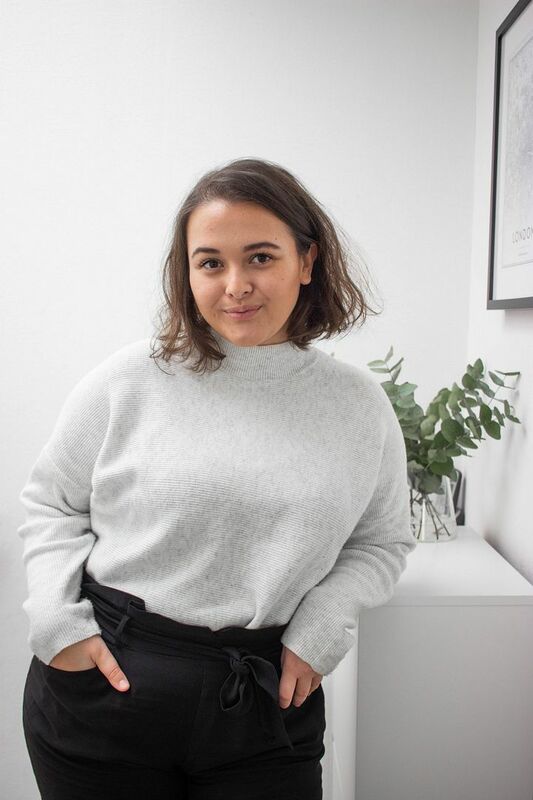 I like to think that I am very open about my skincare history and I tell a lot of people about my acne in real life and love writing about it on my blog. And cystic acne can truly be the most painful thing to have growing on your face. Cystic acne basically means that your pores get blocked; this causes little infections and inflammations to appear on your skin. I am still quite lucky, as I don’t have cystic acne as bad as some other people do. Nonetheless it still makes me feel insecure seeing an inflamed pimple growing on my face and sometimes it can really hurt and leave behind scars. I know I could go to the doctor, but I do believe I can fix this on my own, which is what I have been trying these past couple of years. My main reason being because I truly believe that my acne is worse when I slack on my diet, don’t exercise and generally feel stressed. I can always notice such a difference with my acne when I make changes in my lifestyle. I already wrote a post about that, which you can read here. But besides making some lifestyle adjustments, I also think I can get my skin ‘under control’ with the right kind of skincare. My acne is the main reasons I got into reading lots about skincare. Which led me to the skincare routine I currently use. So I have cystic acne; I get it mostly on my T-zone and my cheeks and have oily skin on my T-zone, however my skin also feels super dehydrated when autumn and winter roll around. 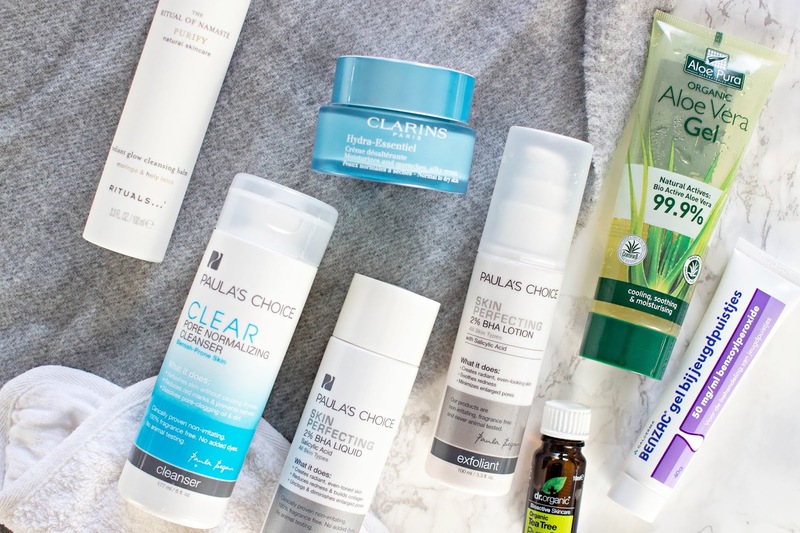 My challenge this autumn was to find some new (and some old) skincare products that don't break me out or give me cystic acne, while also quenching my dehydrated skin. Which led to the following skincare routine. 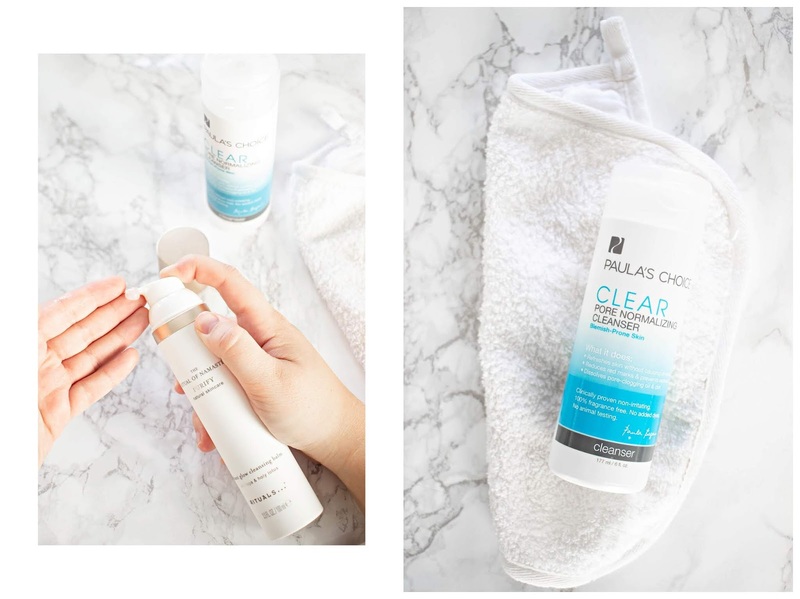 If there’s one thing I have learnt over the years, it’s to always double cleanse your skin every night. I always start by cleansing my face with the Rituals The Ritual of Namasté Radiant Glow Cleansing Balm as my first cleanse. I love using this cleansing balm because Rituals made this a natural skincare brand that has lots of natural ingredients in there, which is just what I want because I don’t want to irritate my skin. This is a cleansing balm that turns into an oil when you massage it into your skin. I then wet my hands with some lukewarm water and start massaging my face some more. This really helps get rid of all of my makeup and all the other dirt that can clog your pores throughout the day. Once I have massaged it into my face and feel like I pretty much got all of my makeup off, I remove the cleansing balm with a cloth. I love to use the one that comes with this cleanser, as it’s super soft and it doesn’t feel like it irritates my skin. 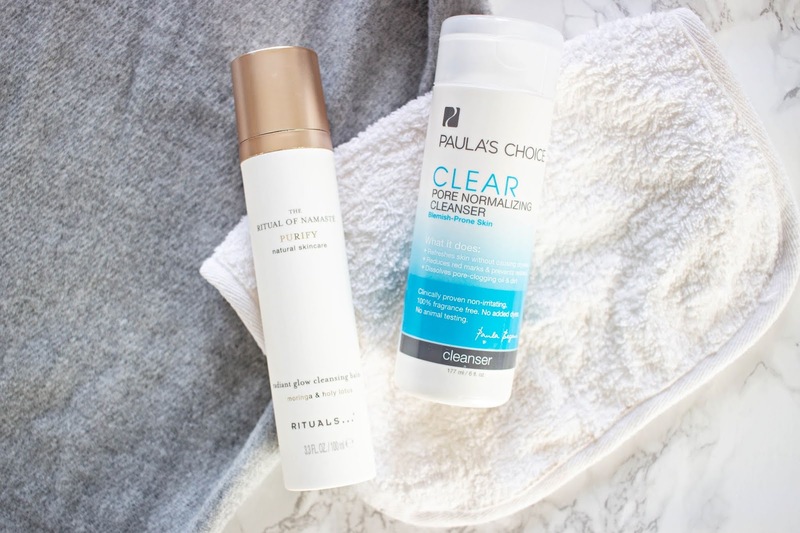 For my second cleanse I use the Paula’s Choice Pore Normalizing cleanser. This year has been the year I discovered Paula’s Choice skincare. I love this cleanser because I feel like it can truly cleanse my face. 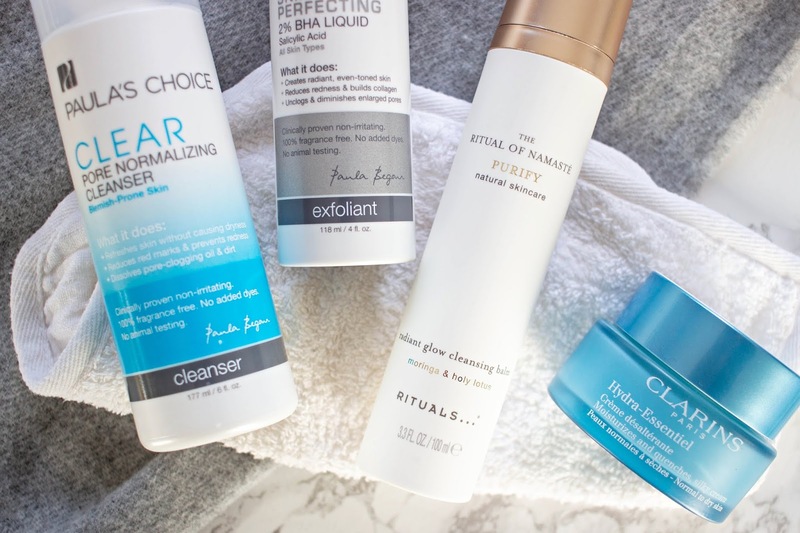 Some cleanser can give you that squeaky clean feeling and make your skin feel super tight afterwards. I love this product because it can really get my face clean without irritating the skin. This is an acne prone skin cleanser, but does not irritate your skin, which is why I started looking into Paula’s Choice skincare. My skin can become quite irritated from lots of products in general. I wanted to try something that would target my acne, but also would not irritate it and cause more cystic acne breakouts. I usually massage a dollop of this into my skin, then massage it in some more with some water and then rinse it off with that same face cloth that I use for my first cleanse. My friend from high school used to use Paula’s Choice products lots back when we were in high school and would always recommend products from this brand it to me. She specifically used to recommend this BHA liquid exfoliant to me, but I was still a bit scared to use products containing words I did not understand on my face back then. Especially when they included the word acid in it. That’s something I would just avoid using. Earlier this year I decided to give the Skin Perfecting 2% BHA Liquid Exfoliant a go anyway. I am slowly getting into the world of acids and can always tell the difference as soon as acids are used in either facials or when I use them myself. Since this exfoliant/acid is one of the most popular ones out there, I decided to give it a go to see if I could jump on that bandwagon. Of course I ended up liking it, mainly because I saw such a difference in how long cystic acne would end up being on my face for. Back in the days, before this, a cystic bump could easily last one or two weeks on my face, but now that I use this, the bump decreases in size within a few days. This honestly is such a little miracle product that I started using again in September after I got a few breakouts. Even though this does help with the whole clearing up cystic acne phase, I do still get acne scars afterwards. I am yet to find a product to help with that, but I don’t want to push my luck just yet. I would much rather have a few acne scars and pigmentation spots left from my breakout than to have a product that might not work so well with this product. After I have cleansed my skin, I would usually put some of this exfoliant onto a cotton pad and sweep it across my face twice. Since there are two sides to this cotton pad, I usually end up sweeping all over my face and down my neck on the one side and then repeat this process with the other side of his cotton pad. It might look like it, but this post definitely is not sponsored by Paula’s Choice. Like I said before, this year truly has been about finding the products that just work for me. And a lot of Paula’s Choice products seem to do just that trick for me. So this is just me truly speaking from my heart and paying for this with my own money hoping it would clear up my acne. 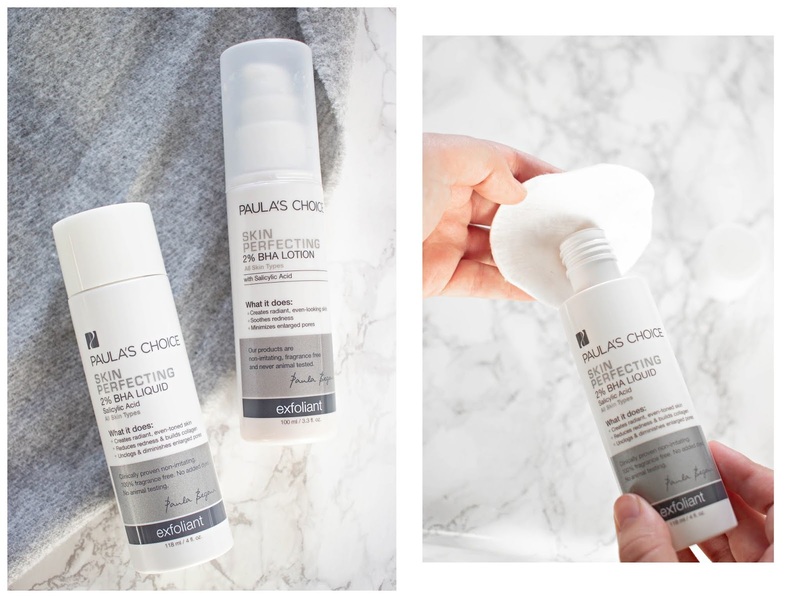 So another product that really helps clear up my skin and helps to get rid off my build-up layers of dead skin is the Paula’s Choice Skin Perfecting 2% BHA Lotion. This lotion, again, helps me get rid of my cystic acne because of the BHA that is in there. But it also feels as if it’s bringing back moisture into my skin after cleansing it. I use this twice a day and it also makes me feel as if my skin looks a lot healthier too. I’m not sure if that’s just me imagining things, but I love using it just for that reason. 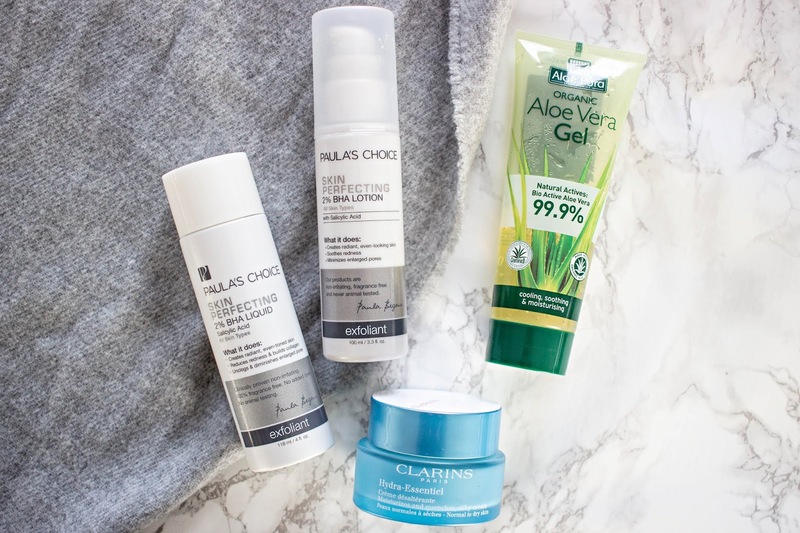 I have praised Aloe vera gel far too much on my blog already, so I won’t talk about it too much in this post. Aloe vera is such a beautiful product, that somehow tends to also work it’s magic for my skin. My cousin gave me this tip last summer to put aloe vera gel onto my acne and said that the bump would decrease in size and would also heal much faster than it normally would. That same day we went out shopping together and I bought myself a tube of 99% aloe vera gel. I can’t live without aloe vera gel anymore, so ever since that summer I have basically used aloe vera gel twice a day every day on my skin. I guess you could say this is my kind of serum. Aloe vera is supposed be antibacterial, which helps heal your skin faster. It helps to calm my skin down a lot and I notice a difference when I put it on my acne as a ‘spot treatment’. It also makes my skin feel super soft, which I always seem to be getting compliments on from friends and family. So once I have gone through all of those steps I finally move on to my final step in my skincare routine, which is my moisturizer. For my moisturizer I always like to switch things up a bit in autumn and winter. I like to go for a bit of a thicker cream that really helps my skin feel moisturized and as if I can handle the cold weather. The Clarins Hydra-Essentiel day cream has been a old time favourite of mine. I think I first bought it when I was still in high school and I tend to always repurchase it whenever autumn rolls around. This moisturizer is great because it is specifically designed for skin that is dehydrated instead of dry. Which is exactly what my problem in life is. Dehydrated skin can kind of feel like dry skin. It starts to feel tight, but it isn’t actually dry. I still get quite confused by this all, but because my skin is dehydrated, it starts to produce more oil, which leads to me breaking out again. So for me it’s super important to have a moisturizer that helps quench my skin to prevent any other breakouts from happening. This cream does exactly that, which is why I am so happy I repurchased it again this September. I use this twice a day in the morning and the evening and it helps my skin a lot. Sometimes I still get acne that can’t seem to be fixed with any of these products I mentioned above. Then it’s time to do some heavy-duty acne or spot treatment. I have two products for this kind of spot treatment that I like to use. The first one is Tea Tree Oil. I use this product the most as it’s mostly a natural product, which isn’t too harsh on my skin. Just like aloe vera, tea tree oil is antibacterial and antiseptic. I usually put this onto a cotton bud and then put it onto the specific pimple that is giving me a particular hard time. If I am feeling particularly brave I go for something that still scares me a little bit while using. It’s benzoyl peroxide. This is some sort of retinoid that helps fight those acne bacteria’s. I am always a bit hesitant with using this because I already am using so many acid products on my skin. This means I usually only ever use this if I can’t get rid of my pimple after a week. After having a pimple for a week or so it’s really going to start to annoy me, I will probably start picking it, so that’s when I know I need to get the benzoyl peroxide out. Benzoyl peroxide supposedly has two functions. The first one being that it brings oxygen back into your skin. Acne bacteria apparently can’t handle oxygen, which helps open up the clogged pores. 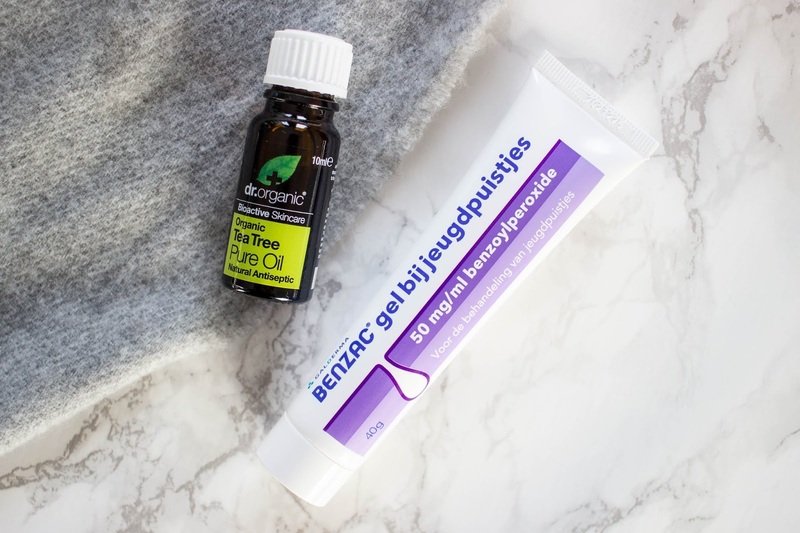 The second thing benzoyl peroxide does is help with inflammatory, which means it helps with the redness and soreness that I tend to have when I have spot.